New Delhi: Satpal Singh, the former wrestler and coach of double Olympics medallist Sushil Kumar, was the lone person in the field of sports selected for the Padma Bhushan, the country's third highest civilian award while five other sportspersons were also named for Padma Shri. 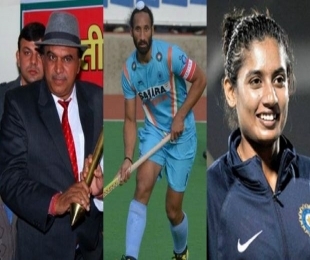 Badminton star PV Sindhu, India's men's hockey team captain Sardara Singh and women's hockey player Saba Anjum, India's women's cricket team captain Mithali Raj and former volleyball player Arunima Sinha, who is presently a mountaineer, were the five sportspersons selected for the Padma Shri. The Padma Bhushan is given for distinguished service of high order and Padma Shri for distinguished service in any field. These awards are conferred by the President at a ceremonial function at the Rashtrapati Bhawan. 59-year-old Satpal, who is also credited to have groomed the likes of Olympic medallist Yogeshwar Dutt into champion wrestlers, was among 20 eminent persons named by the government for the Padma Bhushan. Delhi-born Satpal won a gold medal in 1982 Asian Games and a bronze in 1974 Asian Games. He was conferred the Padma Shri in 1983 and Dronacharya Award in 2009. The run-up to this year's nomination for Padma Bhushan in the field of sports was mired in controversy after Olympic medallist shuttler Saina Nehwal expressed disappointment after Sushil was nominated by the sports ministry in preference to her in the first place. Saina said Sushil was nominated despite the five-year gap rule between two Padma Awards to the same person while leaving her out. Saina had won Padma Shri in 2010 and Sushil in 2011. The Sports Ministry then recommended Saina's name to the Home Ministry though the deadline for doing that has long been over. As per the norms, there has to be a gap of at least five years between two Padma awards to the same person. However, the home ministry has the prerogative to relax the rules in 'highly deserving' cases.